A. O. Exquemelin. 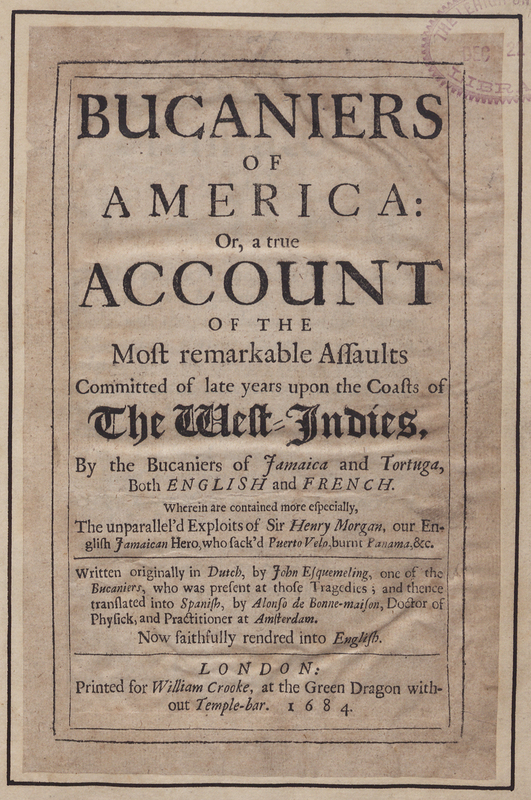 Bucaniers of America: or, A true account of the most remarkable assaults committed of late years upon the coasts of the West Indies, by bucaniers of Jamica and Tortuga, both English and French. Wherein are contained more especially, the unparrallel'd exploits of Sir Henry Morgan, our English Jamaican hero, who sack'd Puerto Velo, burnt Panama. London: Printed for W. Cooke, 1684. Lehigh's copy of this book is the first English translation. The original Dutch "De Americansche zeeroovers" was published at Amsterdam in 1678. Originally driven out of Hispaniola to flee to nearby Tortuga, the buccaneers were pirates of French, Dutch, and English descent who attacked and robbed Spanish ships in the Caribbean Sea during the 17th century as a means to wage war on Spain. The illustration shown depicts Francis Lolonois (1635-1668) with sword and solder-like garb typical of buccaneers during the 17th century. 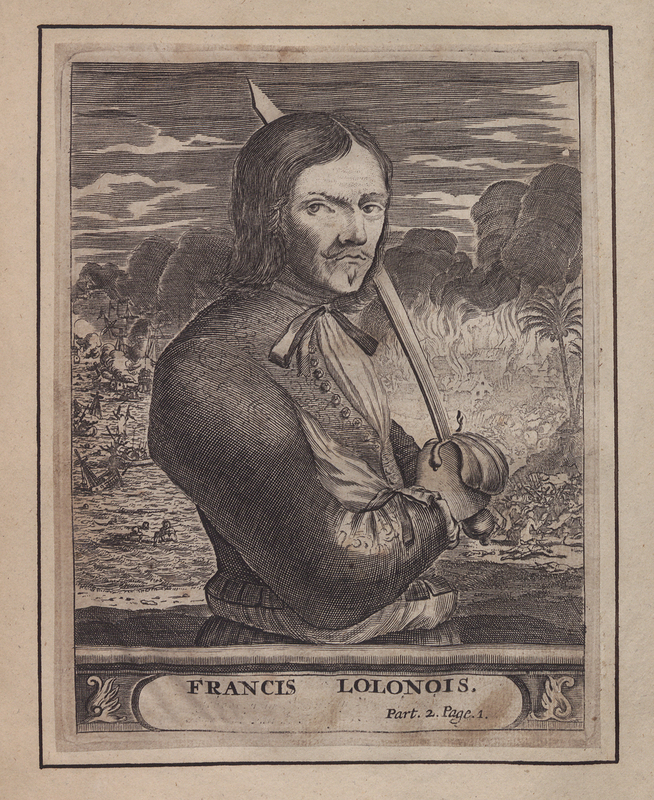 Francis Lolonois was a native of the Les Sables territory in France who was transported to the Caribbean Islands in the 1650s where he became a buccaneer robbing Spanish ships in the West Indies and Spanish Main. In one famous defeat near Campeche, Mexico, Spanish soldiers attacked Lolonois and his crew killing almost all of his men. Lolonois survived by covering himself in others’ blood and hiding amongst the dead. This illustration shows Bartolomew Portugues with sword in hand wearing traditional soldiers’ attire. 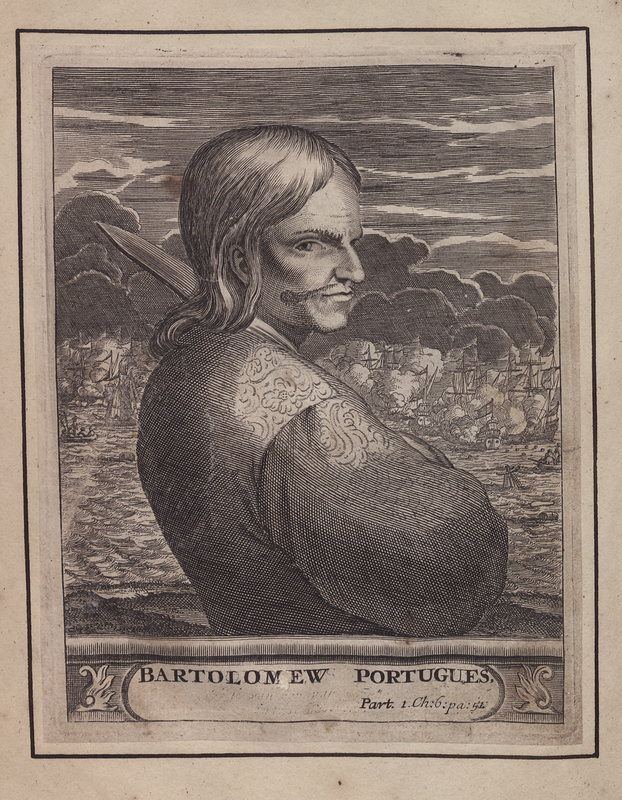 Portugues was a Portuguese buccaneer who attacked Spanish shipping in the late 1660s and established “the Pirate’s Code,” one of the earliest sets of rules known in pirate lore.